This FDA field alert Standard Operating Procedure (SOP) is an essential prerequisite when operating on and supplying the U.S. market with pharmaceutical products. The Standard Operating Procedure (SOP) describes how and when a field alert should be raised with the Food and Drug Administration. The SOP systematically describes the reporting period of 3 working days and other key elements of the FDA’s field alert system. 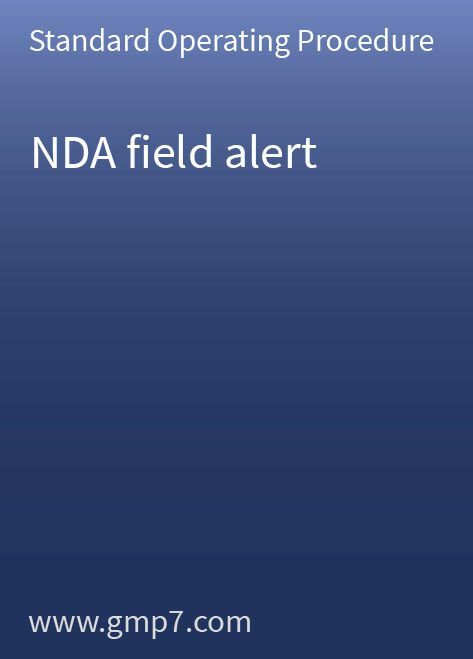 Non-executed or improperly executed field alerts can cause major problems with the FDA, particularly during your next FDA inspection for example. There is a long history of FDA warning letters that address failures to meet the agency’s expectations. This 12-page Standard Operating Procedure (SOP) includes 2 attachments, the FDA 3321- field alert report form and a 4-page PDF copy of the FDA SOP for handling NDA/ANDA field alert reports. The SOP needs only site-specific modification before it can be used for your operations.